Montgomery Physical Therapy & Sports Medicine: Benefit from your stretching routine by following these tips! Benefit from your stretching routine by following these tips! You don't have to put yourself into great pain for a greater range of motion. Instead, only push yourself to a tolerable point of discomfort — a seven on a scale of zero to 10 (worst pain you've ever felt). You want to feel tension in the muscles, but no actual pain. You should be stretching all the major muscle groups below — Both sides! — to promote balance and overall well-being. 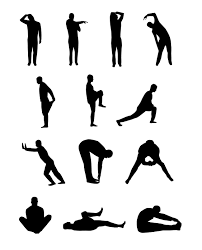 At the very least, perform a stretch (like the ones suggested below) for each of the areas listed below and hold for at least 20 seconds. Calves:Stand in front of a wall with one leg staggered in front of the other. Place both palms on the wall and lean forward as you bend the back knee. Repeat on the opposite side. There are many other areas of the body to stretch, but start here and then add more stretches when your body feels ready for it.